Our WHMCS module provides an automated solution for provisioning compute servers through WHMCS allowing you to offer them to your clients. The module allows you to provision servers either on our public cloud (where you would normally provision servers) or on a private hypervisor. 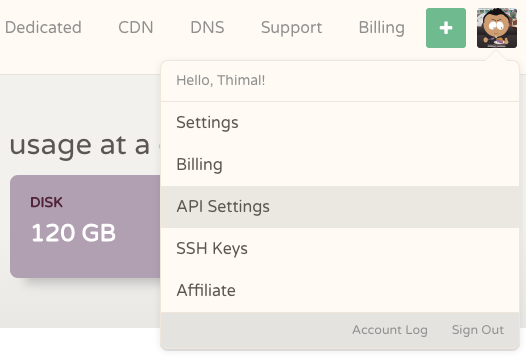 Log in and visit the API Settings page. Generate an API key pair by clicking on the Generate new button and enter a name for you to identify your key. The generated key will be displayed to you on the screen. We&apos;ll use these later when setting up the server on WHMCS. Log in to the admin dashboard of your WHMCS server and navigate to Setup > Products/Services > Servers and add a new server. On the server details section, select CloudCone as the type and enter your API Key as the Username, and enter your API Hash as the Password which we generated earlier. Navigate to Setup > Products/Services and create a new product. Select Other as the product type. Under Module Settings for the product, select CloudCone for the Module Name. Enter the configuration for the resources of your product and save your changes. If you have purchased a private hypervisor, select the private hypervisor or the &apos;Private - Auto Select&apos; option as the hypervisor. If not, keep the hypervisor as &apos;CloudCone Public&apos;. Generate the required configurable options and the custom fields by clicking on the blue color Generate button. Make sure to save any changes you have made to the product before clicking this. Enter the other details of your product such as the price and disable domain registration. You&apos;re now ready to start selling your first CloudCone server on your own website! If you&apos;re deploying servers on CloudCone Public, please make sure that your product configuration is valid. Visit the Compute Create page of our client area to view the limitations of resources such as minimum disk limits for certain configurations.